You’re looking for a position as a store administrative assistant, and you know you need to stand out from the crowd and create a memorable impression. So start with a strong resume! 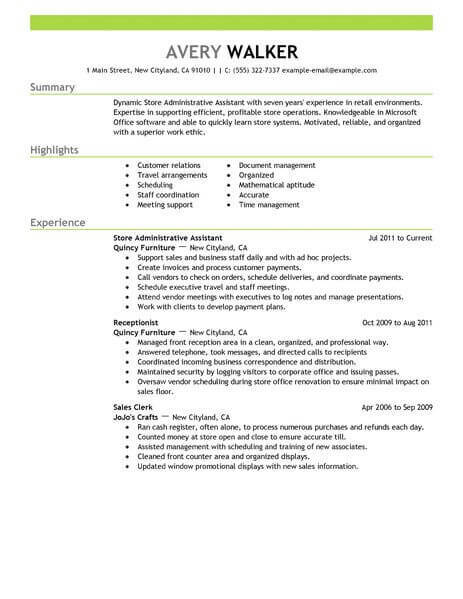 This store administrative assistant example resume can provide an overview and a guide that you can use to draft your own document. Begin with a concise summary of your most relevant credentials, including your positive attitude, organizational capabilities, and flexibility. Then create separate sections for your educational background, your previous work history, and your best skills. Take every opportunity to highlight your past accomplishments and biggest on-the-job challenges. As a store administrative assistant, you’ll play an important part in helping a retail function properly. Your role may involve scheduling, payroll, maintaining employee records, and more. 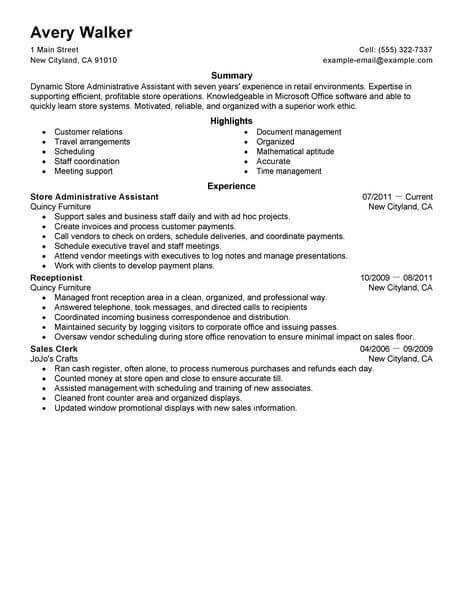 Our store administration assistant resume examples are specifically tailored to the skills employers are looking for in this type of position. Use these resume examples as a base to build your own stand-out resume, so you can win the job. Choose from multiple templates suited to fit your needs. The sooner you get started, the sooner you can start getting interviews and job offers! 1. Bolster your online profile. Many employers search for prospective employees online today, and it is important that you have a strong and positive presence. Join professional organizations and try to contribute and share ideas within your field. 2. Prepare yourself for a lengthy job hunt. While looking for jobs as a store administrative assistant, find out if you qualify for any unemployment benefits and look at your options. Finding the perfect job takes time, and it is important to stay positive. 3. Network both online and in person. The more contacts you make, the more likely you are to find opportunities and job leads. You may also find hiring manager contacts through friends and colleagues. 4. Be proactive and follow all leads, even if they seem like dead ends. Persistence often pays off. 5. 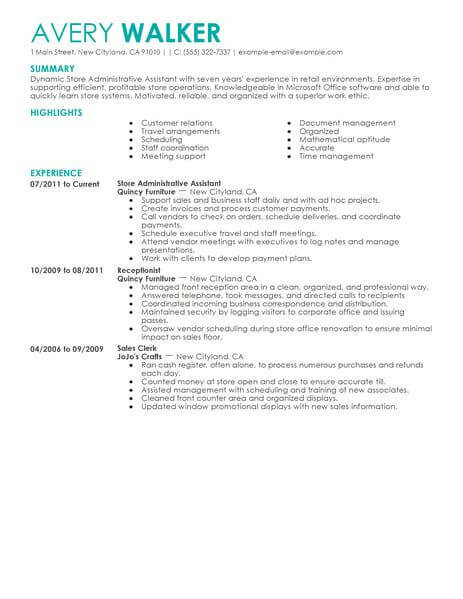 Update your resume to reflect your best highlights and experiences. 1. Use reverse chronological order to list work experience so that prospective employers will see the most current items first. 2. 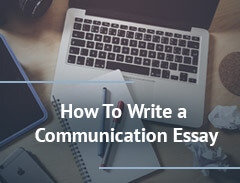 Employ bullet points to emphasize important points and for easier reading. Hiring managers do not want to slog through long, dense paragraphs. 3. Action verbs give descriptions life and show how involved you were at previous jobs. Research industry-specific keywords and incorporate them into your resume. 4. Quantify achievements as much as possible. Use numbers to show how much you got done and how you improved business at your former jobs. Hiring managers want to see how productive you were instead of reading about vague claims of being a hard worker. 5. Do not lie! It is important to always be truthful in a resume whether you are applying for jobs as a store administrative assistant or anywhere else. In the digital age, the truth almost always comes out.